Apart from instructing Conservative Members of Parliament to ignore the views of Conservative Associations regarding the forthcoming referendum on Europe, the Prime Minister, David Cameron, has other very important issues that he does not want you to know about. You will not hear him voluntarily speak about these matters as they are probably the factors which the majority of the nation feel would influence them when making a decision whether to stay in or to leave the European Union. Stop all uncontrolled immigration to this country. To achieve this, Britain must repeal the Human Rights Act, if we do not, ANY OTHER DISCUSSION on attempting to control or restrict immigration to these shores is irrelevant. AS LONG AS IMMIGRANTS ARE ABLE TO STATE THAT THEY ARE CLAIMING ASYLUM, THE UK BORDER AGENCIES ARE POWERLESS TO PREVENT THEIR ENTRY. Figures from Eurostat, the European Commission’ s statistics agency, show that the number of asylum-seekers coming to Britain increased by almost 20% in a year. This country received 38,370 people claiming asylum in the last 12 months. It should be remembered that this figure is only the tip of the ice-berg as it only covers official claims and does not take into account migrants who have not claimed asylum but are living unrecorded in the UK. Let us not forget, the new influx of 38,370 people is in addition to the 500,000 failed asylum-seekers who are appealing against being removed from the UK. The average appeal time was 12 months in 2015. This staggering amount of people is of course in addition to illegal immigrants and EU citizens arriving in the UK to visit or to work. According to John Whittingdale MP, Secretary of State for Culture. Media and Sport, there is a massive discrepancy between the number of EU citizens registered for a National Insurance number and the figures given by the Office for National Statistics. 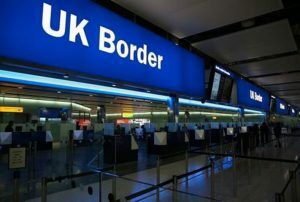 Official figures suggest that 257,000 EU migrants came to the UK but, over the same period, 630,000 EU citizens registered for a National Insurance number. Again, not wanting you to know the truth, the Prime Minister refused a request to release the figures, claiming that the difference is accounted for by short-term migrants. It should be pointed out that all asylum-seekers are provided with free accommodation; whether in a house, apartment, guest house or hotel. They are not LEGALLY permitted to work. Instead they receive weekly vouchers (not cash) to enable them to purchase essential goods such as toiletries. In addition, if the applicant has children, they will be educated at a state school. The applicant and their family will receive free medical and dental care. There are additional benefits for dependent children. In its publications and advice as to how to seek asylum, the Government states that the application process normally takes six months. Should an application be rejected, there are, of course, grounds for appeal. Consideration will be given to whether the applicant would be persecuted or tortured should they be returned to their country of origin. Government guidelines to those seeking asylum state that they must have proof of identification and proof of their country of origin. However, it appears, many asylum-seekers do not have any of these documents (some would have been deliberately destroyed) and do not speak English. They could, if they so wished, state that they came from a country where they would be persecuted if so returned. Should they do so this country would be unable to expel them. During the entire period of the appeal process, the same benefits apply for the applicant and family ie free accommodation, healthcare etc. Again, these are figures that the Prime Minister does not want publicised and discussed by the country at large. If you think Mr Harrington’s statement beggar’s belief, this country’s border security system is also failing to check the passports of every person entering the UK against terrorist and criminal watch lists. Each year approximately 118 million people travel to the UK. The Home Office’s border programme and its successor are supposed to check advanced passport data. However, IT failures have resulted in only 86% of the people entering being checked – leaving some 17 million unchecked. A report by the Commons Public Accounts Committee also reveals that passport checks are not carried out on every one who arrives in the UK in private planes and boats landing at small airfields and small marinas. The new IT database system will not be in place until 2019 – eight years behind schedule, with another £275 million being spent on it, taking the total cost to £1.1 billion. Again, most of the public will not be aware of this fiasco nor will they be aware, that since HM Revenue merged with Customs and Excise, now called HM Revenue & Customs (HMRC), the efficiency of both departments has declined rapidly. Many staff were made redundant. By 2008 there had been 12,500 job losses with 2,500 redeployed to ‘front-line duties.’ Between 2008 and 2011, 200 offices were closed and a further 12,500 jobs lost. In 2011, a survey of 11 government departments revealed that morale at HMRC was the lowest. As highlighted above, ships entering ports and marinas in the UK are hardly ever subject to a full rummage search, which would previously have been conducted by the Customs Water Guard Division. Not only can shipping and smaller pleasure craft be utilised to smuggle people, it is most certainly the ideal avenue for the transport of illegal arms and ammunition. I have personally had experience of being a crew member on a private large motor cruiser which made many trips to the coast of Northern France. Ironically, on one occasion a French rummage crew conducted a search of the vessel in a French port . But on all of the occasions we returned to a marina on the south coast of the UK we were never checked. I am reliably informed that the Border Agency, as it is now called, simply do not have enough manpower to conduct such searches in ports. Most pro-EU campaigners and left-wing MPs would have you believe that most of the immigrants entering this country are from war-torn states and are in legitimate need of sanctuary and accuse the Government of doing little to help. The Government has already pledged to take 20,000 Syrian Mr Richard Harrington MP refugees. Hugh numbers of so-called refugees are in fact economic migrants. A few examples are the claims by 65,935 Albanians and 66,885 Kosovars. Neither of these countries are at war, the applicants merely see a better economic situation in the UK than in their home countries. Britain is a small island. We are already overcrowded. There are thousands of young British citizens unable to afford their first step on the housing ladder. Similarly there are those who have seen their savings eroded by low interest rates and higher energy costs. At the same time we must look on with disbelief at the true story of a Somali mother and her 5 children who are being housed in a property worth £1.3 million who has the audacity to complain that the kitchen needs refurbishing. Needless to say, she will be here forever as she only has to state that she would be persecuted if returned to Somalia. The Human Rights Act once again acting to prevent any expulsion. Those who are campaigning for Britain to remain in the European Union – which includes the Prime Minister – warn of ‘biblical consequences’ and total economic collapse if the nation votes to leave the bloc. Perhaps they ought to consider the socio-economic strain that mass immigration already places on our society. They should perhaps heed the words of David Davis MP, the former Shadow Home Secretary, who warned that there are millions of people, possibly up to 20 million, living on the African Continent who are also looking towards North Africa as a gateway to Europe. What would Europe do then? It has been alleged that Tony Blair, the former Prime Minister, secretly presided over a conspiracy to change the face of this nation with a policy of mass immigration – some 2 million people in all. However, over the last 10 years more than 6 million people have entered the UK. Will current policy-makers please explain to the British public how they are going to provide the extra hospital beds, school places etc. to deal with and cater for all the additional migrants who will enter this country should we remain in the EU? Why should they who dutifully pay their taxes and National Insurance contributions have to endure long waiting times at hospitals, a shortage of affordable housing and overcrowded schools all so we can remain part of the EU? Perhaps the IN side, commanding as they do the support of the Prime Minister and leading figures in big business, have become just a little bit too arrogant. It is thankful at least that some Cabinet ministers and other leading political figures have the courage to challenge this cosy complacency. It is my sincere belief that the only solution to these problems are for the country to vote to LEAVE the EU and for it to repeal the Human Rights Act. No matter what concessions and/or reforms Brussels might offer, there is no other policy option available if this country really wants to properly control immigration.